Engineering graduate from University of Mumbai with over 22 years of industrial experience in various leadership roles. In his second stint with the company, joined Swiss multinational Kuoni Group in March 2011 as global CIO for VFS global group with additional responsibility of CIO for emerging markets for Kuoni’s travel businesses. In early 2012, he moved to VFS global group which required extensive IT usage in various geographies using future technologies. In his present role, he is global CIO for VFS operations in 63 countries across five continents serving to 37 sovereign governments. In his first stint with the Kuoni group, he joined as global CTO for VFS global in Jan 2004 with mandate to strengthen IT delivery globally. 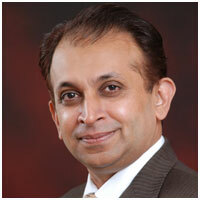 In Sep 2005, he took up role of CIO for Kuoni Travel group, India including VFS global operations world-wide. Over years , he has been part of core team which planned & executed growth of VFS from India centric, 2 client operation in 2004 to what VFS is today. From Jan 2010 to Mar 2011, he served as CIO of Standard & Poor’s (Crisil) for South Asia region, wherein he was also responsible for its KPO business IT delivery having operations in Europe & Americas. In the past, he has worked in leadership role for some of the large corporations in this part of world including G.E. Shipping, Merrill Lynch, Sharekhan.com and IL&FS. Over years, he is recognized as industry thought leader and speaker in various Indian/international forums. Dhiren has also won several industry awards like – CIO 100 award in 2007/2008/2009/2010. He has won awards from RSA, Microsoft & Indian Express publications for his pioneering contribution in the area of information security. Besides winning SAP ACE award & several network computing EDGE awards, he has been part of CIO power list from Cybermedia group. Most recently, NASSCOM (India’s premier body representing IT industry) recognized innovative work done by VFS global using technology at global scale, under his leadership.